Clickable images that engage and convert more sales. A tool for bloggers, content creators and e-commerce. And anywhere that accepts HTML code. Our interface makes it easy to design, store and reuse styles for consistent branding and creativity. Click on your images to add hotspots. Fill in the product name, price and link for a product page. Copy a snippet of code, and paste it where you want your shoppable image to display. Simple! For bloggers: We’ve made it easy to apply nofollow links for sponsored content, and affiliate disclosures for affiliate links. 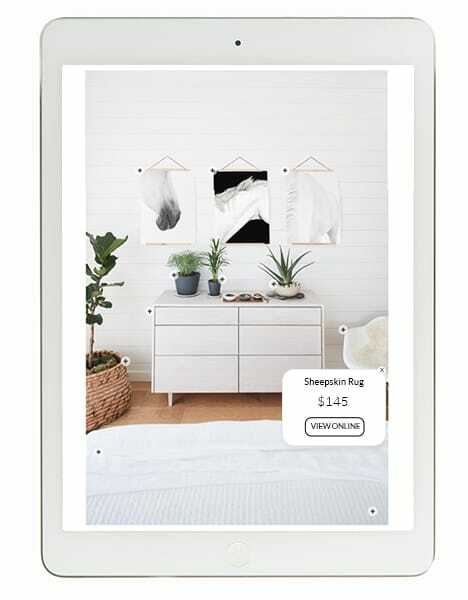 For merchants: Send customers from picture to product page in one easy click. No longer must someone click through dozens of product pages or use unreliable search tools. Linklay’s magic kicks in at the exact moment of inspiration. With more than 50% of internet usage occurring on mobile devices, we know how important it is to make sure your images work harder than ever before – on any device. 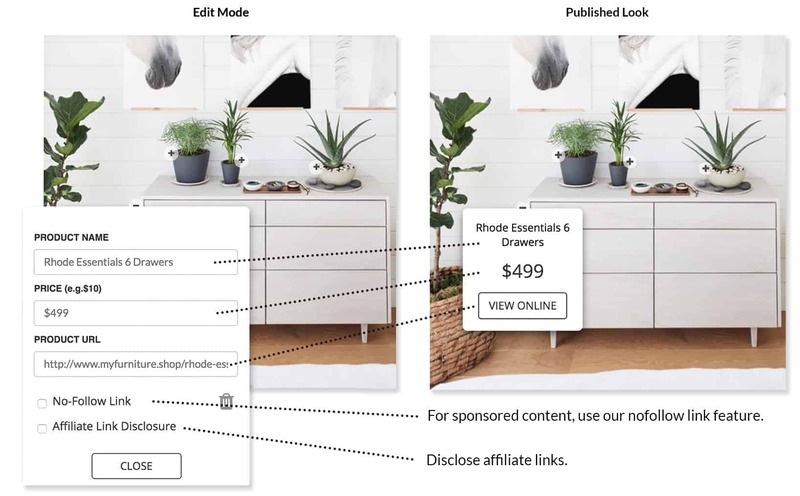 If you blog for profit and use affiliate links or create sponsored content, we’ve made sure you’re able to disclose affiliate links and nofollow links on your shoppable images to stay fully Google compliant. See exactly how people engage with your shoppable images. Understand who is clicking and what they are clicking on to refine your content strategy. Create and save an unlimited number of click-point styles to keep your branding on-point! See examples. Got questions, we’ve got answers! For all our paid subscription plans we offer both email and chat support. We have a proactive image backup plan using Amazon Cloud Services to ensure your images are always displayed. Got a stellar image that deserves prime place on Pinterest? All shoppable images come with an on-hover Pinterest save button. We love our logo, but we keep your images free from our mark – just the way you want them. the commission you earn. Simple.